As frustration mounts in some quarters at the perceived inadequacy or speed of international action on climate change, and as the likelihood of significant impacts grows, the focus is increasingly turning to liability for climate change damage. Actual or potential climate change liability implicates a growing range of actors, including governments, industry, businesses, non-governmental organisations, individuals and legal practitioners. Climate Change Liability provides an objective, rigorous and accessible overview of the existing law and the direction it might take in seventeen developed and developing countries and the European Union. In some jurisdictions, the applicable law is less developed and less the subject of current debate. In others, actions for various kinds of climate change liability have already been brought, including high profile cases such as Massachusetts v. EPA in the United States. 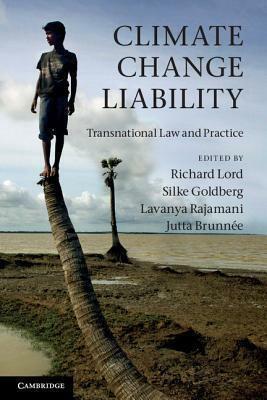 Each chapter explores the potential for and barriers to climate change liability in private and public law. Part I. Legal, Scientific and Policy Aspects: 1. Introduction Jutta Brunnee, Silke Goldberg, Richard Lord and Lavanya Rajamani; 2. The scientific basis for climate change liability Myles Allen; 3. Overview of legal issues relevant to climate change Jutta Brunnee, Silke Goldberg, Richard Lord and Lavanya Rajamani; 4. Policy considerations Jutta Brunnee, Silke Goldberg, Richard Lord and Lavanya Rajamani; Part II. National Laws: Asia and Pacific: 5. Australia Ross Abbs, Peter Cashman and Tim Stephens; 6. China Deng Haifeng; 7. India Lavanya Rajamani and Shibani Ghosh; 8. Indonesia Mas Achmad Santosa, Rifqi Assegaf and Josi Khatarina; 9. Japan Yukari Takamura; Africa/Middle East: 10. Egypt Dalia Farouk and Lamiaa Youssef; 11. Israel Issachar Rosen-Zvi; 12. Kenya Patricia Kameri-Mbote and Collins Odote; 13. South Africa Debbie Collier and Jan Glazewski; Europe and Eurasia: 14. European Union Ludwig Kramer; 15. Germany Hans-Joachim Koch, Michael Luhrs and Roda Verheyen; 16. Poland Bartosz Kuras, Maciej Szewczyk, Dominik Walkowski, Tomasz Wardynski and Izabela Zielinska-Barlozek; 17. English law Silke Goldberg and Richard Lord; 18. Russia Fiona Mucklow Cheremeteff, Max Gutbrod, Daria Ratsiborinskaya and Sergei Sitnikov; North America: 19. Canada Meinhard Doelle, Dennis Mahony and Alex Smith; 20. United States of America Michael B. Gerrard and Gregory E. Wannier; Central and South America: 21. Brazil Yanko Marcius de Alencar Xavier and Pedro Lucas de Moura Soares; 22. Mexico Jose Juan Gonzalez Marquez. Jutta Brunnee is Professor of Law and Metcalf Chair in Environmental Law at the University of Toronto. Silke Goldberg is a Paris-based senior associate in Herbert Smith's global energy practice and a research fellow in energy law at Rijksuniversiteit Groningen, The Netherlands. Richard Lord QC is a London-based commercial litigator with over twenty-five years' experience, particularly of international disputes in the Commercial Court and in arbitration, and with a particular interest in private law aspects of climate change. Lavanya Rajamani is a Professor at the Centre for Policy Research, New Delhi, where she writes, teaches and advises on international environmental law, in particular international climate change law and policy.